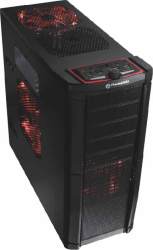 One of the companies that has made a significant impression on us during the 2010 CES was Thermaltake. To kick off the visit to theirs suite, Thermaltake opted to do a live demo for us. This is something that is impressive and also not very common among companies that come to CES as sometimes technology fails and makes the company look bad. Such was definitely not the case for Thermaltake who opted out to show use the potentials of USB 3.0 and their BlackX EX USB 3.0 docking station. During their live test same tests setups were used. As you can see in the video the USB 3.0 finishes approximately 1.5 times faster than USB 2.0 when transferring from the internal hard drive to the external. The real shocker came when the file was copied back from the external to the internal drive. USB 3.0 finished a approximately 3 times faster than the USB 2.0 setup. This test definitely demonstrates the USB 3.0’s superior transfer speeds in a real life test. 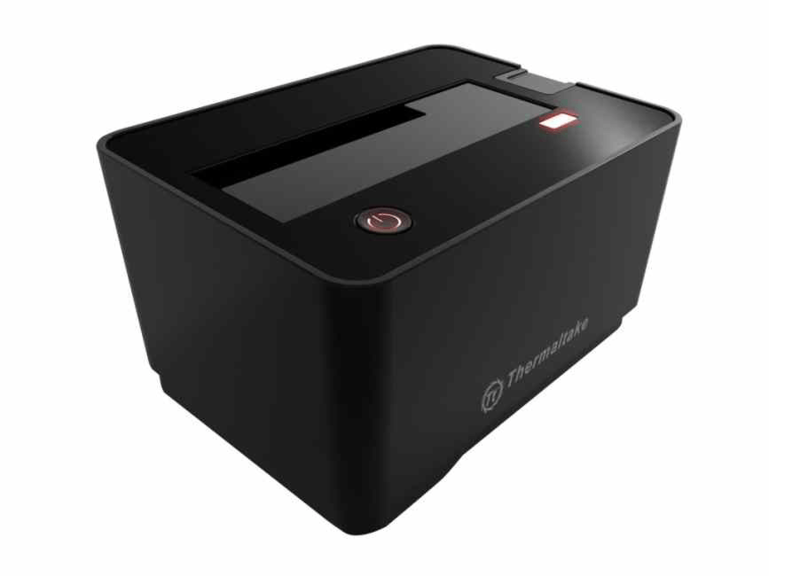 The test also demonstrates the superior data rate capabilities of Thermaltake’s BlackX EX docking station – 5.0 GB/s. In addition to the USB 3.0 stuff, we were equally impressed by their enterprise hot swappable hard drive canister. 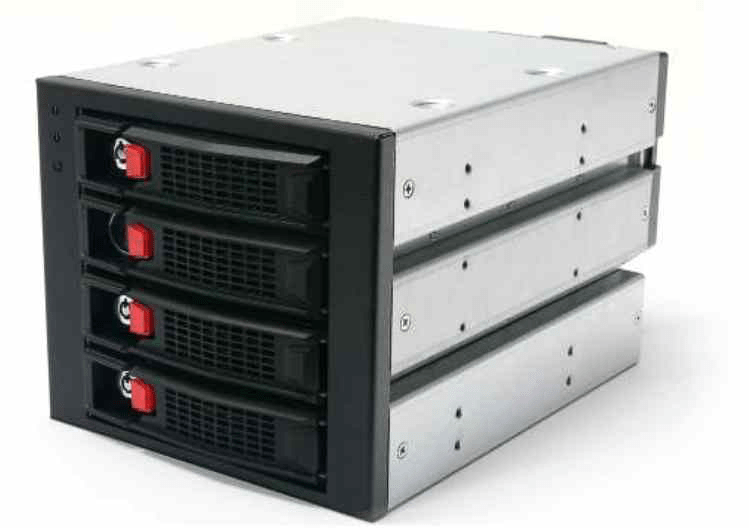 The Max 5 Series include canisters 3, 4, and 5 3.5 inch hard drives bays in a vertical assemble and a 4 – 2.5 inch hard drive canister and horizontal assembly as can be seen in the pictures. 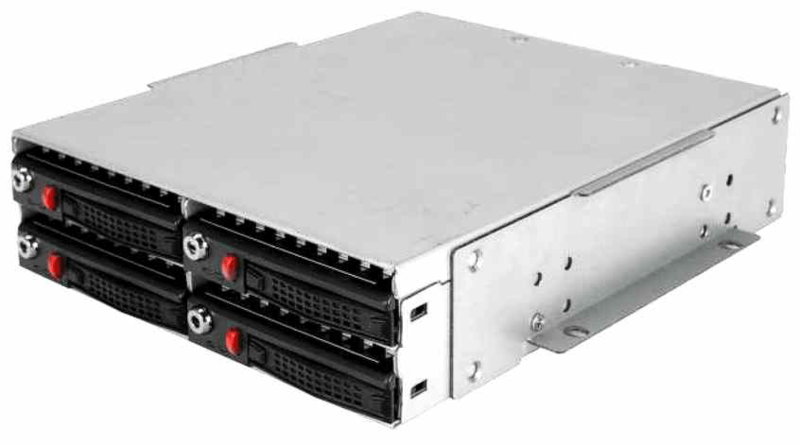 All the canisters support SATA2 and SAS interfaces and are meant to fit into a 5.25 inch bays which will make them perfect not only for people in the enterprise world but home users as well. After blowing our mind with the USB 3.0 performance and showcasing their canisters, we proceeded to take a look at some of their cases and cooling solutions. The case line up consisted mostly of full towers which featured enhanced cooling options and was aimed mostly at gamers. 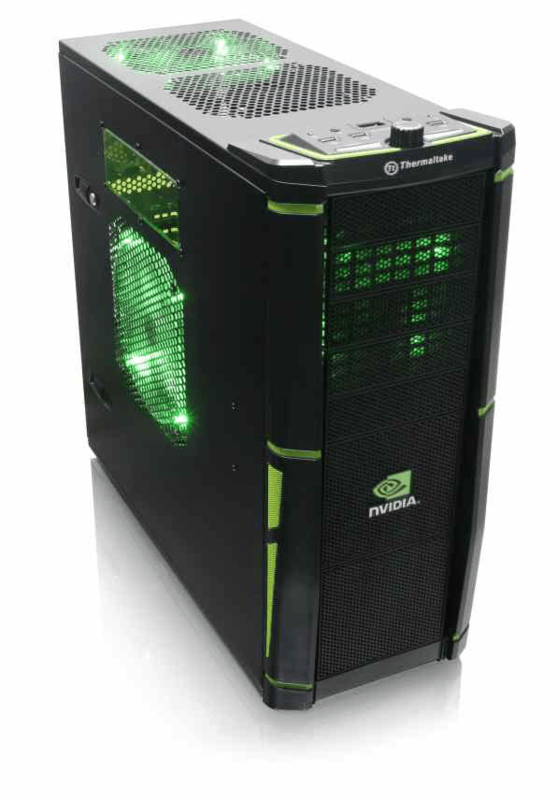 The tag line for Element V and Element V nVidia edition cases was “Create for eSports”. 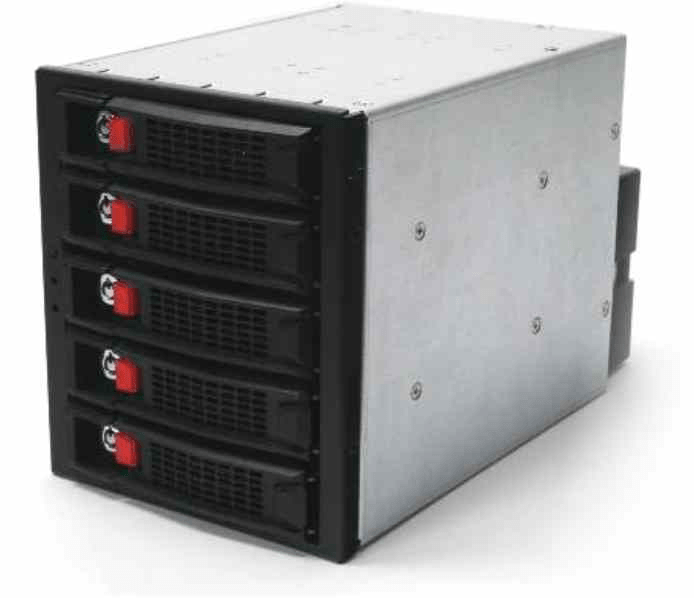 The Element V cases support upto 11×5.25in bays or 5×5.25 and 6×3.25 bays. In addition to this massive amount of space all the other cool goodies like USB 2.0 ports and eSata ports. Thermaltake even decided to leave enough room to fit 8 fans, 3 of which can change into 6 different colors. 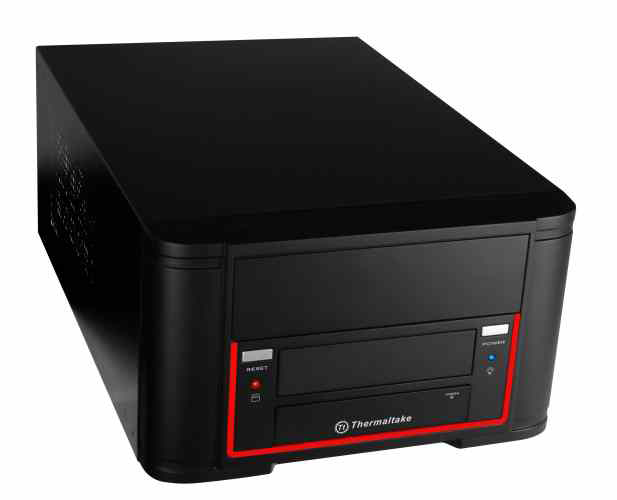 A more modest but still very spacious V3 Black Edition is also capable of fitting 12 x 5.25″ drives, however, only has enough space for MiniATX and StandardATX boards. The V3 also reduces the amount of fans from 8 in Element V to max of 5 and only in one color – Blue. The V3 does offer the same front panel Inputs/Outputs present in Element V cases. 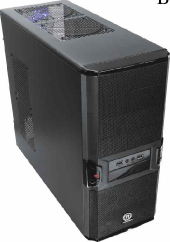 The V5 Black Edition, dubbed “Mobility at LAN party” is a slightly smaller case with support of up to 4 fans and 9 x 5.25 in bays. 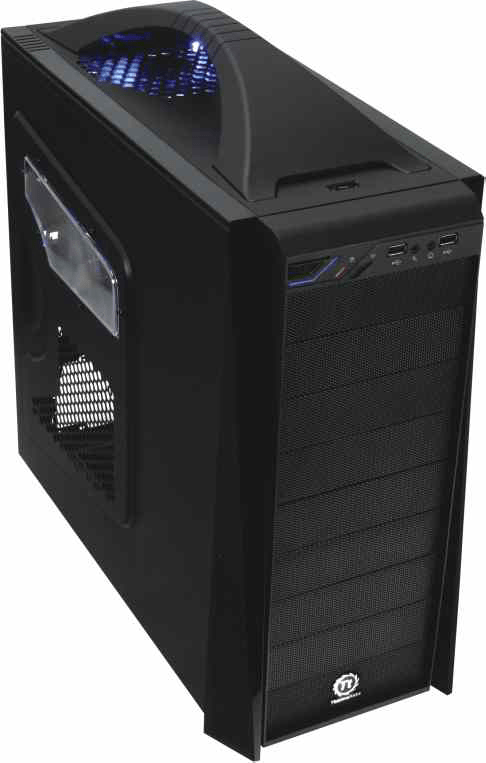 The case includes a hard drive management case with space for 3 x 2.5″ hard drives and unlike the previous cases can only fit Standard ATX and Micro ATX boards. As you can see from the picture below, the case comes with a handle bar that is reinforced for easy transportation to and from your favorite lan events. For those of you looking for even more portability or perhaps an HTPC case, Thermaltake has not forgotten you either. Their Element Q case will only fit a MicroATX board but it will give users the portability in exchange. Element Q comes with a built in 200 W power supply and quiet fan-less design. Another interesting part of Thermaltake’s CES2010 showcase were their coolers. The two coolers that stood out the most were their Frio and the Spin Q VT. 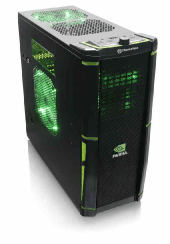 The SpinQ VT design was particularly interesting as it uses a fan similar to those used in graphics cards. Instead of pulling the air through the pipes form one side to the other, this particular fan draws cool air into the middle of the unit and then pushes out the hot air through the top and the bottom. 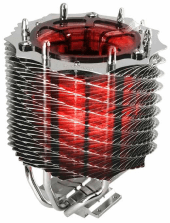 The other exciting unit that Thermaltake had on display at CES is “Frio”. 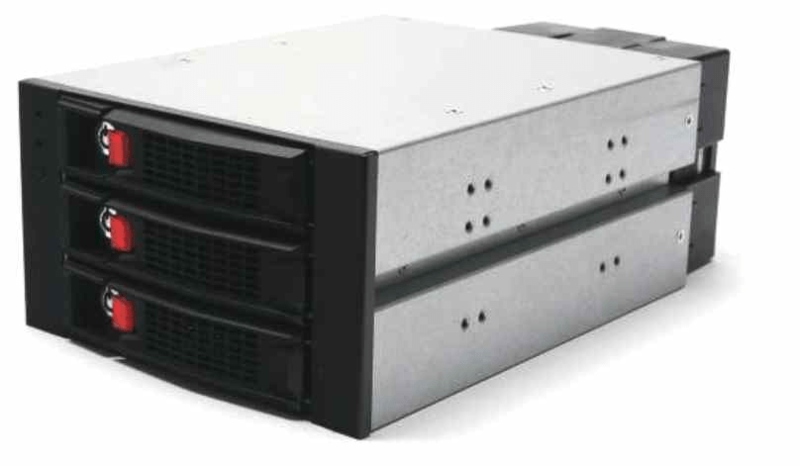 This particular cooler comes with 2 adjustable 1000 ~ 1600 RPM fans that pump air through 5 heat pipes. 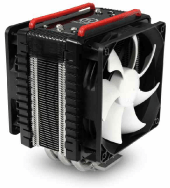 The cooler was dubbed “Designed for Overclocking” . Frio can also take significantly more punishment. It is rated at 220 W heat dissipation vs 160 W heat dissipation for the SpinQ VT.